Written by Shayla Price on March 23, 2018 . Your hard work paid off. A customer made a purchase! happy dance Before you go get a celebratory treat, it’s worth your time to think about the next step in the lifecycle journey. Your customer is expecting a message to confirm her purchase, or what we call an order confirmation email. This type of transactional email is more than just a receipt. It’s an opportunity for your brand to invite the purchaser into the customer experience. From providing order details to thanking the buyer, there’s a lot of ground to cover. Let’s learn how to delight your customers immediately after the purchase. Celebration – Be happy with your customer about the purchase. Show your gratitude and make them feel good about their decision. Information – Give customers accurate details about their purchase. Keeping customers informed helps remove buyer’s remorse. Personalization – Move customers to the next step in the customer journey. Provide them with hyper-relevant resources to customize the experience. Psychologists Lisa Williams and Monica Bartlett conducted a study on whether saying “thank you” makes a difference in developing and maintaining social relationships. Their research uncovered that the words “thank you” goes beyond just good manners. An expression of gratitude can have a positive effect on our interactions with others. By saying “thank you” after a purchase, you open the doors for customers to build a future relationship with your brand. 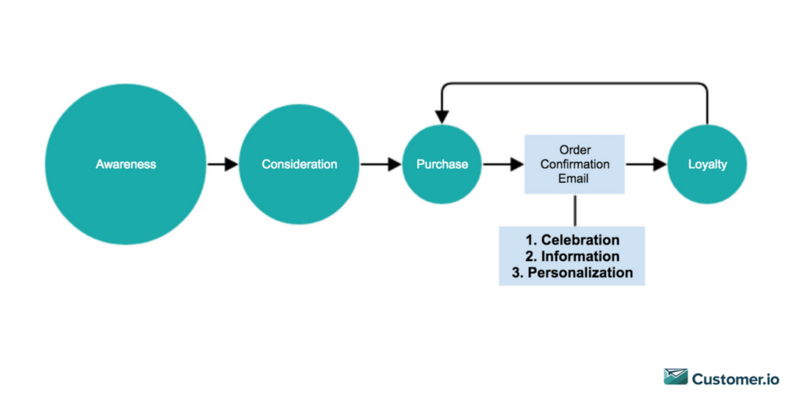 The order confirmation email becomes a shared celebration, rather than a one-person party. 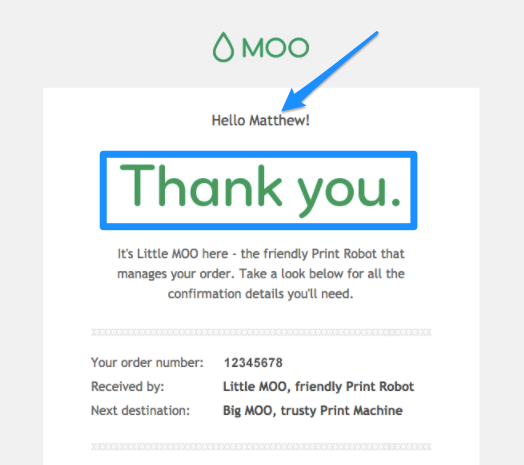 In the example below, online print and design company MOO makes it a point to address their customers by name and thank them at the top of the order confirmation email. That “Thank you” is not only branded in MOO colors, it’s at least 3X larger than anything else in the message. This tactic sets the tone for the rest of the customer interaction. Image Source It doesn’t take much to initiate delight in the customer relationship. You also can extend your appreciation with a personalized message or a dancing puppy GIF. Subject – Gives a reason for the email. Order confirmation number – Provides a reference to a specific purchase. Products/services purchased – Lists all the purchased items (with images). 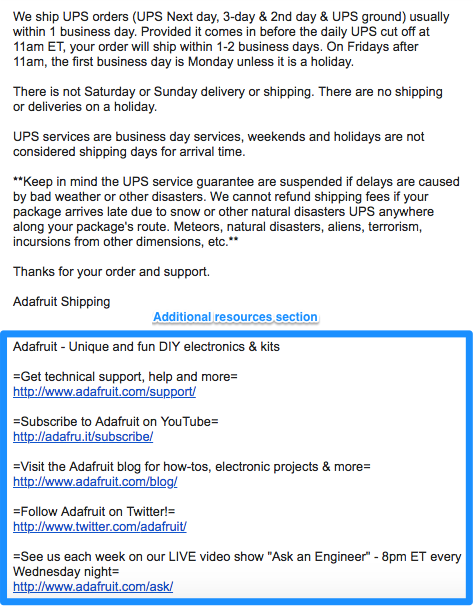 Shipping details – States the customer’s address, shipping method, and estimated shipping time. Summary of billing – Outlines how the specific charges relate to each item purchased. A more complex setup may create customer confusion leading to a flood of preventable customer support tickets. However, you don’t want your order confirmation emails to feel like a laundry list of information. Work with your team and run A/B tests strike the right balance. Take a look at the order confirmation email from Blue Bottle Coffee below. It offers an effective structure and presents the information in a way that preserves the customer’s excitement. 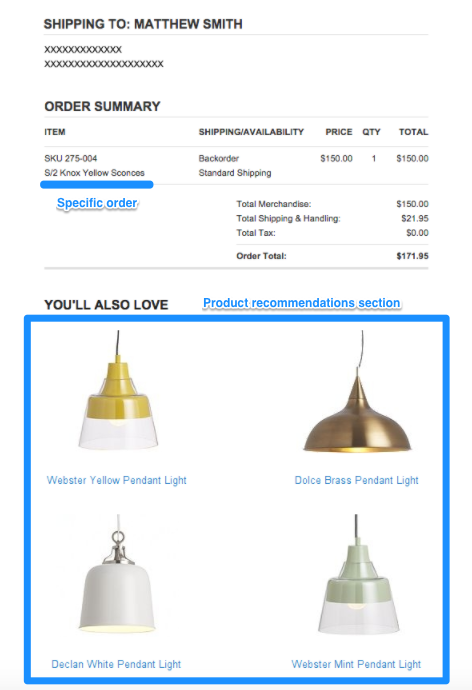 Image Source: Really Good Emails The product visuals are the most notable part of this order confirmation email. Humans are inherently visual creatures. It takes our brains only 13 milliseconds to identify images. Blue Bottle Coffee takes advantage of this phenomenon of the human brain with stylish product pictures. The brand isn’t just reminding you about a purchased item; they’re reminding you how elegant it will look in your home. Their team uses visuals to reaffirm the reason why you bought the product in the first place. The order confirmation email marks the beginning of the customer relationship. 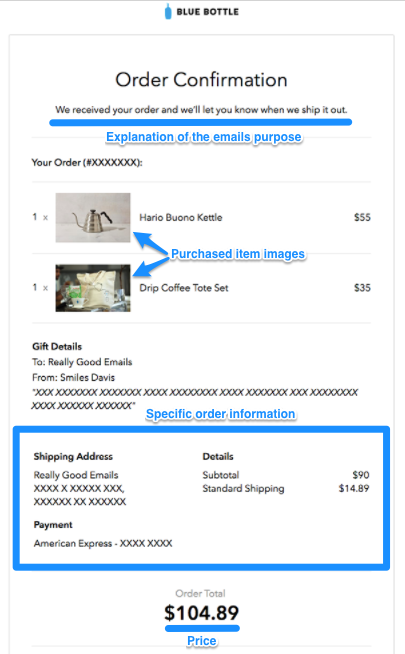 Adding value to your order confirmation emails is how you encourage customers to purchase more items and refer their friends. Personalizing your order confirmation emails is one of the most powerful ways to achieve delight. You can use various data to customize the experience, like browsing history or past purchasing behavior. That data then becomes a catalyst to tailor the order confirmation email. As a result, customers receive more value. You can integrate loyalty programs into your order confirmation emails. This strategy gives customers real-time updates on their progress towards a reward or discount. 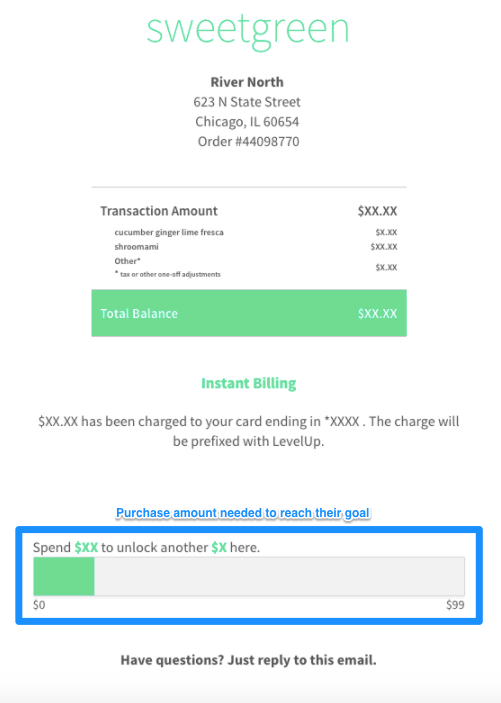 This example below from sweetgreen shows a LevelUp loyalty bar that fills up as the customer gets closer to their next coupon. It keeps a record of how often a specific customer has made a purchase and personalizes the bar based on their past activity. The more the bar fills, the closer the customer comes to a reward. Image Source: Really Good Emails No time for a fancy loyalty bar? You also can include a discount code for customers to share with their friends. This approach prompts engagement, while offering something of value to repeat customers. The order confirmation is a celebration. It’s a useful tool for building the customer relationship. From saying “thank you” to personalized recommendations, your team can delight customers with every order. How do you celebrate purchases in your order confirmation emails? Give us your thoughts in the comments below.